Two of the rock world's most critically lauded albums released in 2002 - Beck's Sea Change (Geffen) and The Flaming Lips' Yoshimi Battles The Pink Robots (Warner Bros.) - made 2002 a year of great music, if only for those two reasons. The Flaming Lips' followed up their 2000 release, The Soft Bulletin, one of pop music's greatest feats, proving that they could one up themselves despite the odds. And Beck went from retro-rock-jazz-pop-disco-hip-hop creator of the past back to his folk roots, releasing the melancholy beauty of Sea Change, quite possibly his swan song. And if that wasn't enough for each artist, and each fan, the two acts finished off 2002 by setting out on tour together, with The Flaming Lips starting off the night, followed by an acoustic set by Beck. The big surprise of the night, none other than The Flaming Lips re-joining the stage to act as Beck's backing band for the remaining 3/4 of his performance. With a highly acclaimed record fresh on the market for each artist, both of them respectively making almost every critic's top ten list for the year, the tour was unstoppable. It sold out well in advance of each stop, Portland selling out a month prior to the Monday, December 2nd performance. Having seen The Flaming Lips four times previously, I knew they would provide the music and the atmosphere, the last two times I saw them going as far as to dress the club up in Christmas lights for the evening. But to what extent they would provide the atmosphere, even with prior experience of their live show, I was not aware of. Employing beach balls and children in animal outfits (decked out with flashlights), the quirkiness that is The Flaming Lips was in full bloom on this night. The visual stimulants just dressing for the aural spectacular the band delivered song after song. Playing mainly selections off The Soft Bulletin and Yoshimi Battles The Pink Robots, the band managed to pull their brief top-40 left-field hit "She Don't Use Jelly" off 1993's Transmissions from the Satellite Heart from their bag of tricks. Celebrating the birthday of one of their crew, Wayne Coyne, The Lips' front man, decided to throw a loud, gigantic birthday party, complete with birthday blood. Smearing the 'birthday blood' all over his face, The Lips began singing "Happy Birthday" to their crew member, also dedicating the song to an audience member who insisted it was his birthday as well. The music perfectly executed, beach balls hovering above the crowd as everyone jumped at a chance to hit a ball back up in the air, the band decided to add even more ambiance and take things one step further. Playing in front of a gigantic projector that showed various images, they furthered the visual stimuli that turned their already dreamy, psychedelic, indie-pop sound into a spectacle. If you thought the production value of The Soft Bulletin or Yoshimi Battles The Pink Robots was something to marvel at, the band's live production will have you wetting your pants in uncontrollable excitement. Of course, all good things must come to an end. The Flaming Lips exited the stage after a short 45 minute set, the highlight of the night ending sharply at 8:45pm. But, before leaving the stage, Coyne announced the band would be back, as Beck's backing band, an announcement that garnered tons of applause. Beck hit the stage with just a guitar, a chair, and a microphone, a black cloth backdrop hiding the keyboards, bass, guitars, and drums that would later be played by The Lips. Playing a medley of his own tunes, choice selections off of Sea Change, and a beautiful cover of The Flaming Lips' "Do You Realize?" (found on Yoshimi Battles The Pink Robots), Beck seemed to be off to the perfect start, delivering the somber, melancholic portion of the evening. Then The Flaming Lips entered the stage and the Beck the troubadour turned into Beck the funk dancer, as the two teamed up to deliver Beck's grooved-up, funky, retro-pop tunes. Which wouldn't have been a bad thing had Beck been into it. His performance seemed lackluster and tired, as if he would have rather been at the hotel sleeping or dealing with his past relationship woes with just himself and the acoustic guitar, something more than one audience member (including myself) would have preferred as well. 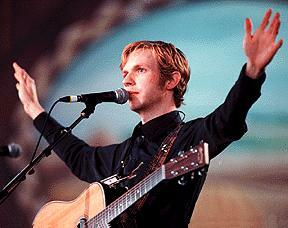 With a release like Sea Change just out, the acoustic Beck is what I was craving. 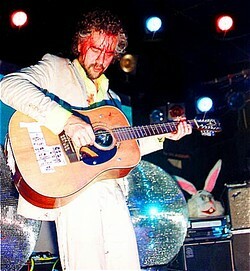 Then again, given the chance to have The Flaming Lips back you, you must take advantage of it. And there in lies the problem. The Lips were uncanny and dead-on as ever, adding the pre- and post-song banter, the charisma, and charm that made Beck's performance tolerable. Beck, however, just danced around in a half-dead manner, seemingly caring only to get the show over with and move on for the night, an attitude that even The Flaming Lips couldn't rejuvenate, despite their attempts. 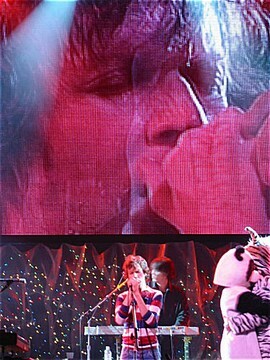 Still, seeing The Flaming Lips and Beck together, and seeing The Flaming Lips back Beck, was an unforgettable evening. The Flaming Lips were flawless and turned Yoshimi Battles The Pink Robots into a living, breathing organism, while Beck's Sea Change still stands as one of 2002's best albums despite his performance. You can't fault a genius like Beck for having an off night, especially given his hit-making track record and fan base that would rather hear more of his dance-rock songs than his melancholy musings.